The Colour view’s basic mode only shows the Colour list. 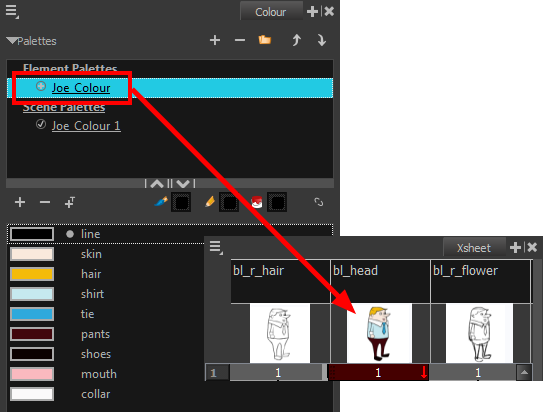 When you open Toon Boom Harmony, you only see the colours available in the Default palette which contains six basic colour swatches and is automatically named the same as your scene. For simple projects, you can manage with the default palette, but for movies, series, or shorts it is recommended that you create palettes for your characters. 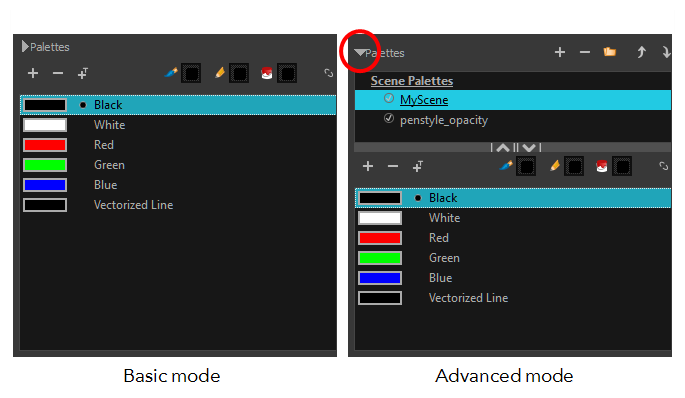 To create a palette, you have to switch to the Advanced mode of the Colour view and show the Palette list. The Advanced mode displays the list of all palettes that are linked to the scene. To create palettes for your characters, you must display the Palette list. A palette list is a file containing all of the links to the original palette files. Every drawing layer has a palette list. The scene also has a palette list. For example, a drawing layer can use three different palettes stored in three different locations, while another drawing layer can use two of these palettes plus another one coming from another scene. The palette list keep track of the locations of the palettes. The Scene Palette list is mainly used with cut-out animation, but is also very useful for paperless and traditional animations. A cut-out character will often be divided into 20 to 30 different drawing elements that use the character’s master palette. The Scene Palette list is the simplest one to use. By default, Toon Boom Harmony is set to use only Scene Palette lists. In Toon Boom Harmony, you can switch to Advanced Palette List mode and choose to save your palette at an element’s level. The Element Palette list is mainly used with traditional and paperless animation. Unlike cut-out animation, all columns (drawing elements) contain different characters, props, backgrounds, and effects. The Element Palette list is used when you do not necessarily want all of the palettes for all of your elements linked in every column. 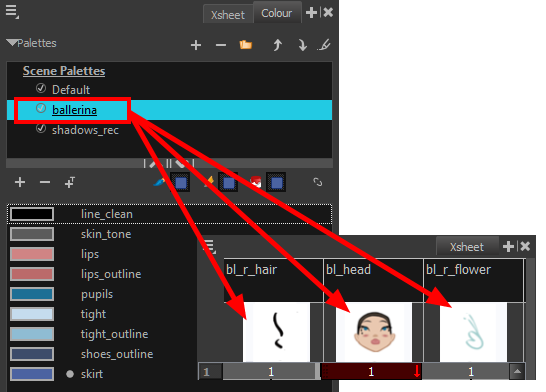 The palette list is stored in the drawing element’s directory instead of directly in the Scene level. This ensures that the links to the palettes appear only in the appropriate element. If you prefer to access a global palette list, link your palettes to the Scene Palette list. When you are using several cloned palettes that are related to the same original palette, Toon Boom Harmony uses the palette located highest in the list to determine the colour of the painted zones—see Cloning a Colour Palette . ‣ From the Colour View menu, select Palettes > Move Up or Move Down. ‣ In the Palette list, click the Up and Down buttons.